Do I Bring Out the Worst in My Kids? Two words that I would never use to describe 2- and 3-year-olds: rational beings. They’re like little angels and demons; Jekylls and Hydes. And they can switch between the two so fast your head will spin. 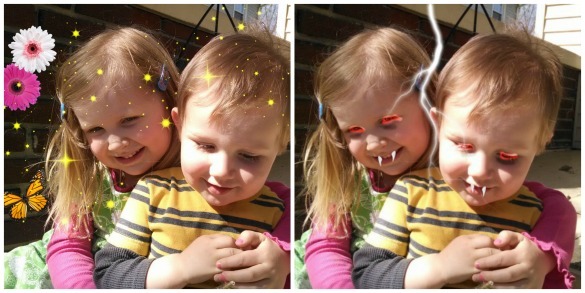 Angels and sparkles and light one minute; lightning and fangs and claws the next! One morning, my 3-year-old will be a model of independence. She’ll go potty, pick out a (usually questionable) outfit, and get herself dressed. The very next morning? Oh, the torture that is getting dressed. Woe! Agony! Drama! “I will NOT put on my socks. I will NOT put on my pants. I want to go naked to school.” Clearly that can’t happen, so there is much fighting and coaxing and trying to convince an irrational person that she needs to get dressed. My daughter is the same way! If anyone expects to get attention out of her I have to leave the room, often causing tears, and then 5 seconds later she is enjoying playing with whomever is there! It can be a real drag too to have her be such a pain, whining & clingy with me..and .with everyone else she is a prefect child, maddening! I wish I knew how to change that too…is it just a mom thing?! Yes my 3 yr old totally changes the moment I walk into the room or as soon as we get home. Walk in the door and it’s like the gateway for the crazed screaming child some days ha! Some days it feels like it’s only my kid that acts this way, so sorry but I’m glad it happens with your kids as well. Don’t feel so alone!! Mom I want this for supper, so I make it. Call her for suppr and she starts screaming and crying. What was wrong you ask? She wanted oatmeal!! That’s now what she wanted at all!! Jeeze gotta love them!